It'll feature a single screen that can fold in the middle — and will let you use up to three apps simultaneously. Phone or tablet? If that's a question that you've ever asked yourself, Samsung now has the answer. This week, the company unveiled the prototype for its new foldable smartphone, confirming one of the biggest rumours in the technology game. 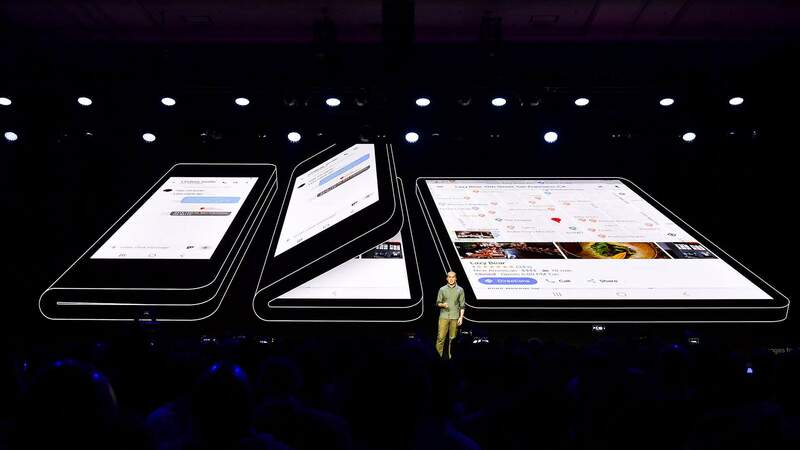 At the Samsung Developer Conference in San Francisco on November 7–8, the company revealed a device that's clearly still in development, but combines the best of both worlds when it comes to regular-sized touchscreen phones and their larger siblings, aka tablets. The handset boasts a new interface and display that enables it to both function as the former and fold out to become the latter — for those times when you just need a bigger screen, we guess. The interface is called One UI and is designed for one-handed use, anchoring the most relevant information to the bottom of the screen. As for the Infinity Flex Display, as well as being able to fold in the middle, it will also move whatever you're looking at from its smaller size to its larger size as you unfold the phone. In what might be one of the biggest drawcards, it'll support simultaneous app use when the larger display is used, thanks to functionality Samsung has dubbed Multi Active Window. Yes, this means that you can have three things open and active at the same time. Design-wise, the device uses one single screen that is foldable down the centre like a book, instead of flipping from the top like the clamshell handsets that have long defined the way we all think about flip phones. Other details are scarce — this was Samsung's first real teaser that the new foldable format is definitely in the works, rather than an actual product launch. It's not the first time that the company has mentioned the device. Speaking with CNBC earlier in the year, IT and mobile communications division CEO DJ Koh noted that more details would be revealed at SDC — although clearly we'll all have to keep waiting for in-depth specifications, and even information such as a name, release date and price. Contrary to how the device might seem at present, Koh also noted that it won't just be a tablet in a more compact form.